Dar Les Cigognes boasts a full service spa, offering a broad range of treatments including massage, facials, waxing, manicure and pedicure, as well as traditional henna tattoo.We also offer traditional Moroccan hammam treatments in gorgeous marble steam rooms. A hammam is a traditional Moroccan steam room. Under the marble floors, walls, and benches run pipes with steaming water, raising the temperature of the marble. Water splashed on to the marble fills the air with mist and steam. 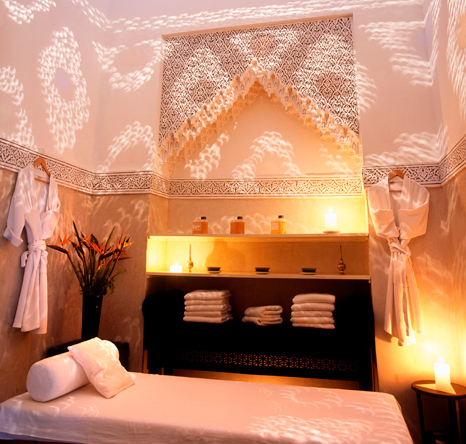 To destress and detox, there is no better way than to visit a traditional Moroccan steam bath, a hammam, and have a deeply relaxing massage or rub-down. Guests often combine a visit to the hammam, a truly cleansing experience, with a visit to our spa for a relaxing and energising massage or other luxurious treatments. You will be spoilt for choice. The Sanssouci Collection has developed its own range of spa and beauty products based on the organic and highly anti-oxidant Argan oil, a beauty secret of millennia of Berber women.